For the entire account — tap Statistics at the bottom of the screen (account summary statistics are also available). 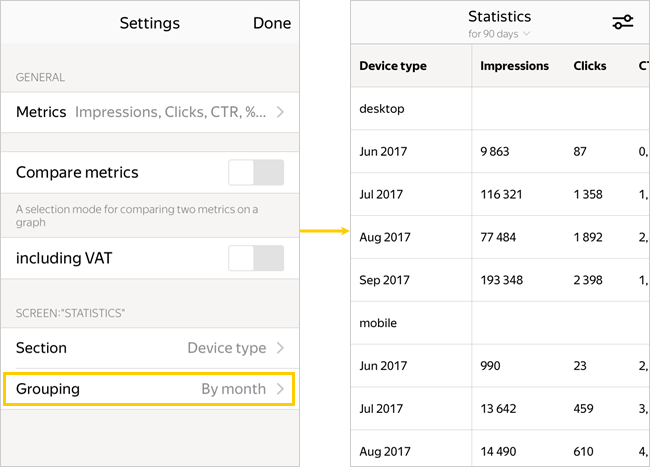 For individual campaigns, ads, ad groups, and keywords — tap → Statistics on the corresponding screen (for example, on the campaign screen). How do I display statistics for a given time period? How do I select metrics and put them in order? How can I display two graphs? How do I include VAT for monetary metrics? How do I select a data section for the statistics table? How can I set up a grouping for a statistics table? How do I organize data in a statistics table? Tap the screen heading and select the time period you want to view. If you only want to track certain metrics, you can select them from the general list. Statistics on these metrics are available as tables or graphs, either for a single metric or for two metrics simultaneously. Tap → Metrics and select the items you want from the list. 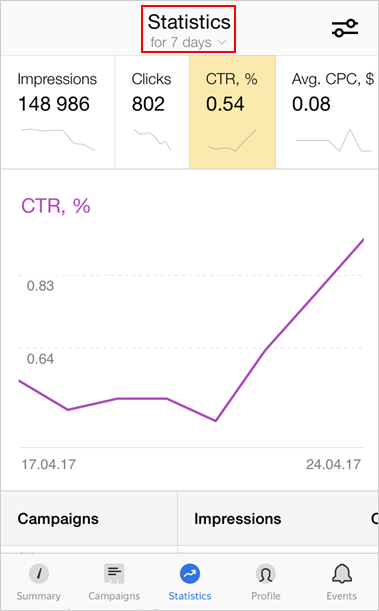 The metrics selection applies to all statistics screens in the app. The first five metrics are displayed on the Summary screen. 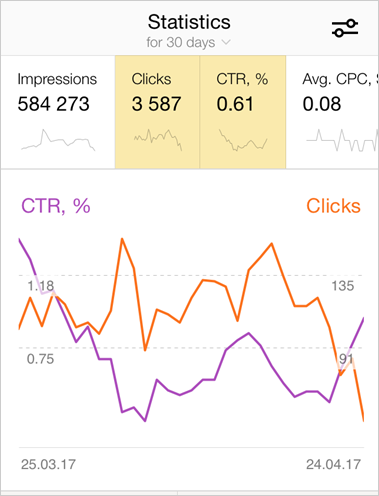 The first three metrics are displayed in the lists of campaign, ads, and ad groups. The first metric is displayed in the keyword lists (with the bid and position or coverage). To change the order of the metrics, move them up or down in the list using the button. 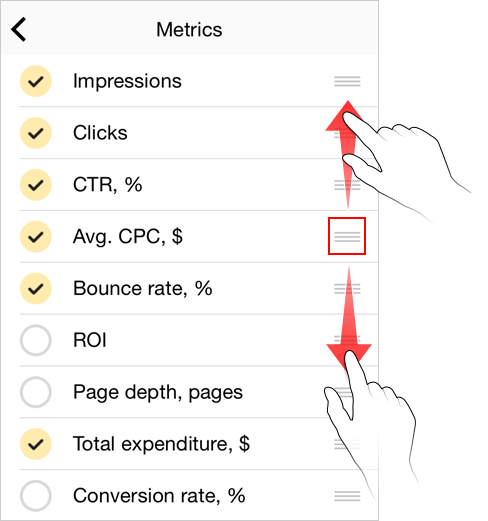 On any statistics screen, tap and then enable Compare metrics. Then you will be able to select two metrics on all statistics screens and view their graphs simultaneously. Tap , then enable Include VAT. VAT will then be added to all monetary metrics values for the whole app. You can select a data section for the statistics table. For example, if you select the Device type section, you will see impression data divided into desktops, smartphones, and tablets. 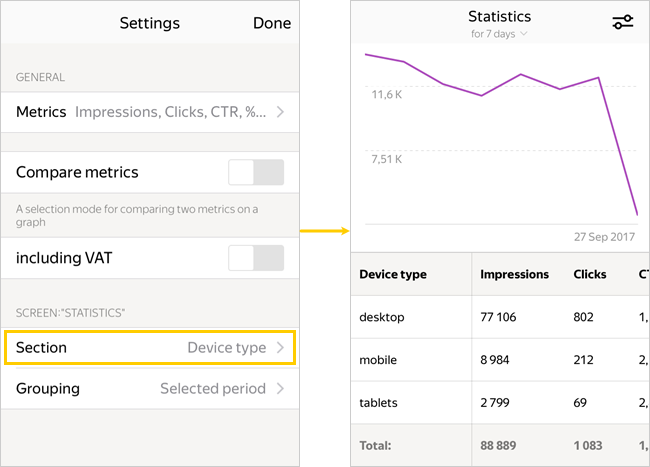 In the app, you can select a data sections related to the settings of your campaigns, ads, keywords and the data about the users who saw your ads. On the statistics screen, tap → Section. You can select different data sections for different statistics screens. You can group the data in the table by different periods. For example, if you group by week, you can view data for each week separately. On the statistics screen, tap → Grouping. You can select different grouping for different statistics screens. To sort a table by column, tap the column heading. How do I display statistics for a given time period?How do I select metrics and put them in order?How can I display two graphs?How do I include VAT for monetary metrics?How do I select a data section for the statistics table?How can I set up a grouping for a statistics table?How do I organize data in a statistics table?